The Minister’s full statement in the House and a copy of the Bill is here. Mr Dunch said, “The tabling of the Casino Gaming Amendment Act 2017 last Friday was a potentially sad and seriously backward mis-step in the ongoing efforts of Bermuda to introduce a moral and apolitical gaming regime, free from the potential of corruption. “At face value, it would appear to be a knee jerk reaction arising out of the Minister’s great frustration with the refusal of the Chairman of the Commission to resign [in the absence of reason]. However, it is far more alarming that his proposed amendments would compel the Commission to give up its independence and follow any general directions given to it by the Minister. “This in and of itself should be of great concern to the Bermuda public. It will mean the Minister has the power to interfere in all of the Commission’s dealings and ongoing work. It means the Minister is asking Parliament to give him an absolute, unchallengeable right to tell the Commission what to do and the Commission, despite its own convictions and expertise, will be unable to refuse. “It means Bermuda’s gaming industry may essentially become an arm of the Government. Who we issue gaming licenses to and who we approve as operators, may no longer be based on our internal [and internationally-recognized] suitability standards, but those of the Minister’s. “This will not resonate well within the international gaming community and may seriously impede Bermuda’s ability to attract first-class people of the utmost integrity to operate and regulate the casino industry going forward. “According to the Statement read in Parliament by the Minister last Friday, he makes a number of unfortunate and incorrect assertions about the Commission in an attempt to justify the steps he seeks to have Parliament take. “In essence, he accuses the Commission of  pursuing a “systemic misinformation campaign” which is intended to damage Bermuda’s reputation as well as the gaming industry,  refusing to “engage in a collaborative and mutually respectful relationship” with the Government,  endeavoring to damage the Government, and  refusing to acknowledge and accept “change”. “There have been very few interactions [either by email or in person] between the Minister and the Commission since July 2017. The Commission has made every effort to engage with the Minister and work with him to move the gaming initiative forward. However, it is the Minister himself who has engaged in a course of non-communication and complete silence on multiple occasions. 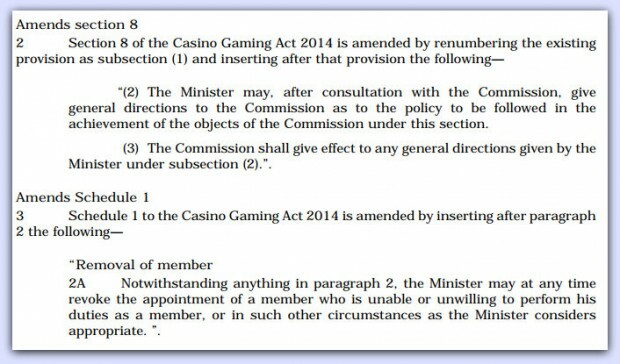 “The Minister has systematically refused to meet with the Commission, engage with the Commission in writing or by telephone, assist the Commission with the enactment of a regulatory package that was presented for tabling in Parliament last May or generally in any way assist the Commission in its ongoing efforts to get Bermuda’s first casino up and running in circumstances where a provisional casino license has in fact been issued. “It is regrettable that the Minister seeks to attack the Chairman, if not directly then certainly by inference, in his personal capacity. His attempts to impugn the Chairman’s character and integrity by suggesting that unfounded and ulterior motives lie behind his conduct as Chairman are misconceived and without substance. “Indeed, given his refusal to engage in any way with the Commission, it is difficult to understand upon what basis he would make such accusations. His selective and out-of-context reference in his Ministerial Statement to “a public fight” was one small part of the Chairman’s response to his letter of the evening of October 20th, 2017 in which he published accusations about the Chairman that were defamatory, accusations that he was called upon to substantiate, but which he has not done. “It was made clear to the Minister that the Chairman does not take kindly to having his character, integrity and reputation called into question and that if he continued to do so in public then such defensive steps as were necessary would be taken. “To place things in context, it is important to be clear on the circumstances under which the Commissioners took on their role. “When the late Shawn Crockwell asked them to do so, they agreed to his request on the primary and fundamental basis that the Commission would be/ seen to be operating beyond and without political interference. “From the very get-go the Commissioners made it clear to the then Government that the Commission, which was being tasked with the introduction and development of gaming in Bermuda, must be able to operate and function in an autonomous environment. “We made it clear and publically announced that we were not taking on the role in circumstances where any prior arrangements had been agreed to. The Commission was commencing its work with a clean slate. This was fundamental to ensuring the development of casino gaming in Bermuda would be given tacit approval by the international gaming community and, as a result, allow Bermuda to benefit from the experience and expertise of others already involved in the global industry at large. “The Commissioners have at all times since their appointment sought to assure the public that this is our overriding goal. We have given, and once again give, this assurance to the Minister and the Government. “The Commissioners and the Commission’s staff have no other goal or agenda other than this. It is not political and it is not personal. We are motivated only to do what is in the best interests of Bermuda – and aim to do so without fear of intimidation, victimization or political interference. “At the end of the day, the Commission accepts that with a change in Government there often follows a change in direction in any number of areas. Gaming may be one of them. “But given the basis on which the Commissioners were appointed and accepted their appointments [which was enshrined in the enabling legislation], we consider it our responsibility to try and ensure that the Commission remains free from the appearance of any political interference and that any and all of its decisions be regarded as independent. “In terms of the best interests of Bermuda, it would be ill advised and most unfortunate if the proposed amendments were to be passed by Parliament, approved by the Senate and assented to by the Governor. The Commission does not support them and can only hope that the Government will rethink its position,” Mr Dunch added. “As our legislation mirrors the Singapore legislation in many ways, this change brings Bermuda in line with the jurisdiction on which our original legislation was modeled. “On the issue which has been the subject of a systematic media propaganda campaign, I will further reiterate that the Progressive Labour Party Government has not conceived, considered or given any assurances public or private that either the cashless gaming system or that operator will have a presence in our casino gaming industry. It was the OBA Government that accepted a $30,000 donation from MM&I for a pro gaming campaign. “While there are those who would engage in mud slinging, innuendo and propaganda, this government is focusing on executing the mandate that Bermudians gave us on July 18th to change the status quo, empower Bermudians and create economic growth for all,” the Minister said.